Traditional putters weigh between 330 and 350 grams while heavyweight putters weigh between 450 and 550 grams. Heavyweight putters are nearly twice as heavy as regular putters and are available in most putter shapes, including blades and mallets. The idea behind the heavy putter is that it will help to solve the "yips" that many golfers develop on short putts. The heavy head promotes a cleaner pendulum stroke, making it easier to control distance and direction, particularly on short putts. Many heavyweight putters are made by Boccieri Golf, which debuted its "Heavy Putter" line in 2005. The key to heavyweight putters is a shift in the location of the weight in a putter. While the head is heavier in Heavy Putter models, there is also additional weight added to the grip, according to "Golfers" magazine. This additional weight--regular putters weigh 330 to 350 grams while Heavy Putters are 450 to 550 grams--discourages a golfer from breaking his wrists during the putting stroke and encourages the pendulum motion. In addition, golfers should set up with the putter head flat on the ground, and according to The Sand Trap, the sole of the club should be flat. Heavyweight putters play on a golfer's core muscles and encourage swings from the big muscles in the shoulders and back rather than the wrists or arms, according to Boccieri Golf. The bigger muscles are more stable, making the pendulum stroke more consistent. 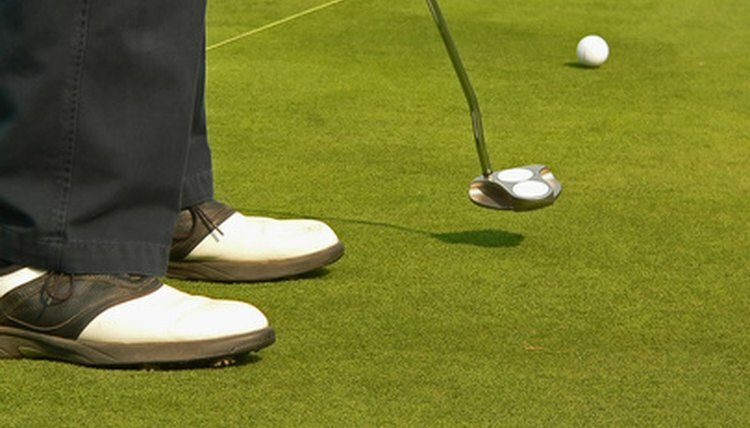 Golfers can also improve their consistency by strengthening core muscles in conjunction with using a heavier putter. Because the putter also has weight in the grip, the center of gravity on the putter is closer to the golfer's center of gravity, making the stance and swing more stable. Golfers who have the "yips" or are referred to as "handsy" have a tendency to break their wrists when putting. This habit can be hard to break, but heavyweight putters discourage breaking of the wrists. Golfers can also practice keeping the wrists straight when putting by using swing aids that are even heavier than heavyweight putters. When using a heavyweight putter, golfers should grip the club more loosely. Though this can take a while to get used to, heavyweight putters encourage a lighter grip--which helps solve the "handsy" problem--because the small muscles of the wrist and hand are not in play with this kind of putter, according to The Sand Trap.